Due to the transit of Jupiter this year, Gemini people shall be happy and experience good times. Both your health and wealth will be enriched. You may experience changes in your social circle and your interest in occult, mystical and metaphysical will increase considerably. You will also be interested in spirituality. You will have to be extra careful about matters related to joint finance, your spouse's family or inheritance. You may also suffer from confusion and self doubt regarding the matters of your career. However you should trust your instincts and present to the world the real you. On the home and domestic front, Gemini people shall be lucky this year. The domestic environment will remain peaceful and you may go on a pilgrimage. You should however not do anything to invite the anger of your elders and should always choose the right path as luck is favoring you. It is also a good time to host auspicious functions at home. The influx of guests and social visitors at your home will increase this year. You may remain busy in networking and forging new bonds this year but don't ignore domestic issues. This is a good year to tie the nuptial bond. And those of you who were single may find the love of their life. Those of you already in relationships will take them to the next level and those relationships that are in nascent stages will be strengthened and get developed. Any emotional union forged this year may also experience higher longevity. 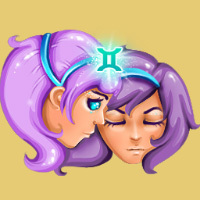 Gemini couples may find increased understanding with one another and will do lots of activities together. Refrain from harshly criticising your partner. Since a plenty of areas in your life look set to be sorted now, you may end up neglecting your physical health. This may lead to fatigue, mental nervousness and obesity. Hence Gemini people should try to eliminate these three harbingers of bad health from your health graph so that you enjoy a good health. Also, no major health hazards are foreseen this year for you. You should try to maintain a healthy lifestyle so that you don't suffer from ill health and should remain cautious. You should try to keep your eyes open in matters related to joint finance and avoid at all costs in getting into a partnership with your spouse's family member/s. On the career front, you should always trust your instincts. On the domestic front, try to maintain cordial relations with all and be understanding.